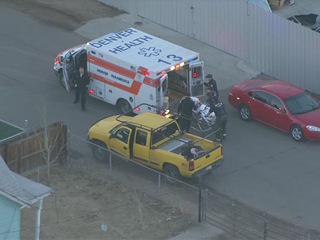 Several people, including children, were wounded or killed in a shooting today in Denver. Several people, including children, have been hurt or killed in a Wednesday morning shooting at East 49th Avenue and Pearl Street in Denver. A child was seen being carried out of a home on a stretcher and loaded onto a waiting ambulance. The child was taken to Denver Health. AIRTRACKER7 flew over the area around 7 a.m. and spotted heavy police presence centered on a small, flat-roofed duplex. A tricycle and a small toddler-sized basketball hoop can be seen in the back yard. Denver Police tweeted that there were “multiple victims” in this shooting but did not say more.